This infrared 5MP resolution camera module has 1080p video and still image capture capability and is designed to connect directly to your Raspberry Pi . Connect the built-in ribbon cable to your Raspberry's CSI (Camera Serial Interface) port, run the latest version of Raspbian and you're ready to go! The camera offers static image resolution of 2592 x 1944 pixels and supports 1080p 30, 720p60 and 640x480p60 / 90 resolution for video shooting. 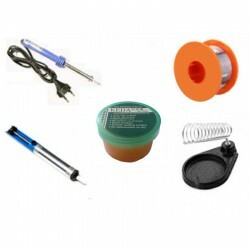 Best for Smasung Mobiles: S3, S4, S5..
Includes:Soldering IronSolder Sucker/ Desoldering PumpSoldering Iron StandSoldering Paste (50g)Solde..